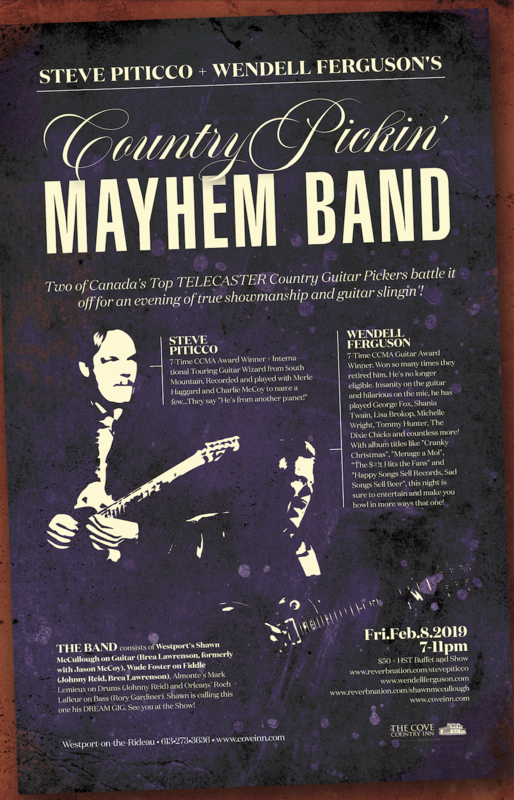 Two of Canada’s Top TELECASTER Country Guitar Pickers battle it off for an evening of true showmanship and guitar slingin’! WENDELL FERGUSON – 7-Time CCMA Guitar Award Winner. Won so many times they retired him. He’s no longer eligible. Insanity on the guitar and hilarious on the mic, he has played George Fox, Shania Twain, Lisa Brokop, Michelle Wright, Tommy Hunter, The Dixie Chicks and countless more! With album titles like “Cranky Christmas”, “Menage a Moi”, “The $#!t Hits the Fans” and “Happy Songs Sell Records, Sad Songs Sell Beer”, this night is sure to entertain and make you howl in more ways that one! THE BAND consists of Westport’s Shawn McCullough on Guitar (Brea Lawrenson, formerly with Jason McCoy), Wade Foster on Fiddle (Johnny Reid, Brea Lawrenson), Almonte’s Mark Lemieux on Drums (Johnny Reid) and Orleans’ Roch Lafleur on Bass (Rory Gardiner). Shawn is calling this one his DREAM GIG. See you at the Show!